Helena Schweiger is a Senior Economist at the EBRD. She holds a PhD in Economics from University of Maryland, College Park and her main research interests include applying micro-to-macro empirical analysis to try to understand the causes of differences in productivity and growth across countries, businesses and time, and their policy implications. All over the world, large and persistent differences in productivity continue to exist across both firms and countries.2 Transition countries are no exception in this regard. There are firms with low and high productivity in each of these countries: there are highly productive firms in Central Asia and poorly performing firms in the EU. What determines aggregate productivity is the percentage of firms with low productivity relative to the percentage of firms with high productivity. Compared with Israel, an advanced industrialised country with several innovation successes,3 transition countries have a higher percentage of firms with low productivity and a lower percentage of highly productive firms (see Chart 2.1). This, of course, results in lower average productivity at the country level. Israel also has a more compressed distribution of firm productivity than any of the other countries shown – possibly because Israeli firms tend to be more advanced in terms of the technology they are using, but also because Israel is more competitive than the average transition country.4 The ratio of the 90th to the 10th percentiles of the log of labour productivity – a measure of variation in productivity across firms – ranges from 1.19 in Israel to 1.59 in Tajikistan. In most EBRD countries and regions this ratio tends to be higher for services than it is for manufacturing. Within manufacturing, the productivity spread tends to be lowest in high-tech sectors, which face strong competitive pressure to innovate and reduce costs. The spread is highest among providers of services, which (unlike producers of manufactured goods) do not face such strong competition from imports. ICT-intensive sectors are characterised by high levels of labour productivity, and this holds for the transition region as well. The largest productivity premiums for these sectors relative to other manufacturing industries can be found in central Europe and the Baltic states (CEB), south-eastern Europe (SEE), and eastern Europe and the Caucasus (EEC). Within the EEC region, this is particularly true of Armenia and Azerbaijan, two countries with a strong focus on ICT in their innovation policies.6 However, in most countries differences between the productivity levels of individual firms are also large within ICT-intensive sectors. Thus, even in these sectors, it seems that many firms have ample scope for improving their productivity. Note: The red line is the fitted distribution for Israel. Firm-level labour productivity is measured in logs and defined as turnover per employee. Cross-country differences in sectoral composition are controlled for. Turnover in local currency is converted to US dollars using the average official exchange rate.7 Density is calculated by dividing the relative frequency (in other words, the number of values that fall into each class, divided by the number of observations in the set) by the width of the class. In which sectors does innovation boost labour productivity most? Chapter 1 showed that product innovation is more prevalent in high-tech manufacturing sectors and knowledge-intensive services. However, these are not necessarily the sectors with the largest returns to innovation (see Chart 2.2). Sam Mills is an interesting case – an agribusiness company which has managed to significantly increase the value added by its products through substantial R&D activities. Sam Mills is a Romanian group specialising in corn processing, corn-based food ingredients and, more recently, snacks and gluten-free products. The group’s first company was founded in 1994 and focused on corn milling. Sam Mills has grown over the years and now comprises a total of 10 companies with a wide range of activities, including the production and distribution of many different corn and pasta products. Substantial investment in R&D activities since the mid-2000s has enabled the group to develop higher-value-added products such as feed, corn-based food ingredients and, more recently, healthy snacks and food products (mainly gluten-free pasta, cereals and products with a low glycaemic index). As a result, the group is one of the few companies in Romania that sells products through established retail chains in the United States, the EU and Asia (including chains such as Walmart, Wegmans and Delhaize), as well as selling products via Amazon and in specialist health food stores. Note: This chart reports the impact of innovation at firm level by sector, reflecting the impact on the dependent variable firm-level productivity, which is measured as turnover (in US dollars) per employee. The results are obtained by estimating a three-stage CDM model by ALS, where productivity is linked to innovation, and innovation, in turn, is related to investment in R&D. For a detailed description and the set of control variables included, refer to Box 2.1. The baseline model is adjusted slightly to account for the smaller sample size resulting from regressions on sector subsamples. State ownership variables are not included, as there are too few observations in some regions; the use of email is not included when explaining the incidence of R&D, as in some regions all firms make use of email. A robustness check on the baseline regression in Table 2.2 indicates that the main results remain valid after applying these adjustments. All coefficients associated with the impacts shown are statistically significant at the 1 per cent level. Sectors are based on ISIC Rev. 3.1. High-tech and medium-high-tech manufacturing sectors include chemicals (24), machinery and equipment (29), electrical and optical equipment (30-33) and transport equipment (34-35, excluding 35.1). Low-tech manufacturing sectors include food products, beverages and tobacco (15-16), textiles (17-18), leather (19), wood (20), paper, publishing and printing (21-22) and other manufacturing (36-37). Knowledge-intensive services include water and air transport (61-62), telecommunications (64) and real estate, renting and business activities (70-74). Source: BEEPS V, MENA ES, Chart 2.2 and authors’ calculations. Note: For definitions of sectors, see the note accompanying Chart 2.2. In a management field experiment looking at large Indian textile firms, improved management practices resulted in a 17 per cent increase in productivity in the first year through improvements in the quality of products, increased efficiency and reduced inventories.23 This suggests that improving management practices may be a relatively low-cost and low-risk way of boosting firms’ productivity across the transition region. BEEPS V includes a subset of questions on management practices taken from the Management, Organisation and Innovation (MOI) survey conducted by the EBRD and the World Bank.24 These questions look at core management practices relating to operations, monitoring, targets and incentives. They range from dealing with machinery breakdowns to factors determining the remuneration of workers. On the basis of firms’ answers, the quality of their management practices can be assessed and given a rating, which can then be used to explain productivity levels (see Box 2.2 for details). Estimates suggest that improving the average firm’s management practices from the median to the top 12 per cent is associated with a 12 per cent increase in labour productivity, everything else being equal (see Table 2.3). The estimated impact on productivity is larger still when process innovation is also accounted for (standing at 19 per cent). Despite these sizeable effects, estimated returns to better management practices tend to be somewhat lower than returns to innovation, regardless of the type of innovation. There are significant differences across regions in terms of the role played by improved management practices in boosting firms’ productivity. In EU member states, candidate countries and potential candidate countries (in other words, the CEB and SEE regions), where the quality of management practices tends to be higher, returns to further improvements in management practices are lower than returns to process innovation (see Chart 2.4). In the SEE region, process innovation is associated with an increase in labour productivity of more than 150 per cent. This may be largely due to the upgrading of production facilities with the aim of being more competitive in the EU market. On the other hand, in less developed countries, where the quality of management is generally lower, returns to better management practices are much higher than returns to process innovation. In the EEC region, for example, better management practices are associated with a 40 per cent increase in labour productivity, whereas the introduction of a new process is associated with a mere 6 per cent increase. In Russia returns to better management and process innovations are estimated at 32 and 2 per cent respectively. These findings raise the question of why firms in these regions (and less developed countries more generally) do not adopt better management practices. The recent management field experiment looking at large Indian textile firms suggests that this may be due to information barriers. Firms might not have heard of some management practices, or they may be sceptical regarding their impact.25 Improvements to certain management practices – particularly those relating to underperforming employees, pay or promotions – may also be hampered by regulations or a lack of competition (since competition could force badly managed firms to exit the market). The EBRD’s Business Advisory Services (BAS) and Enterprise Growth Programme (EGP) promote good management practices in micro, small and medium-sized enterprises (MSMEs) in the transition region, providing direct support to individual enterprises.27 Box 3.4 analyses links between the use of consultancy services, innovation, management practices and productivity in the transition region. Note: This table reports regression coefficients for firm-level innovation, management quality, capacity utilisation and capital intensity in the manufacturing sector, reflecting the impact on the dependent variable firm-level productivity, which is measured as turnover (in US dollars) per employee in log terms. 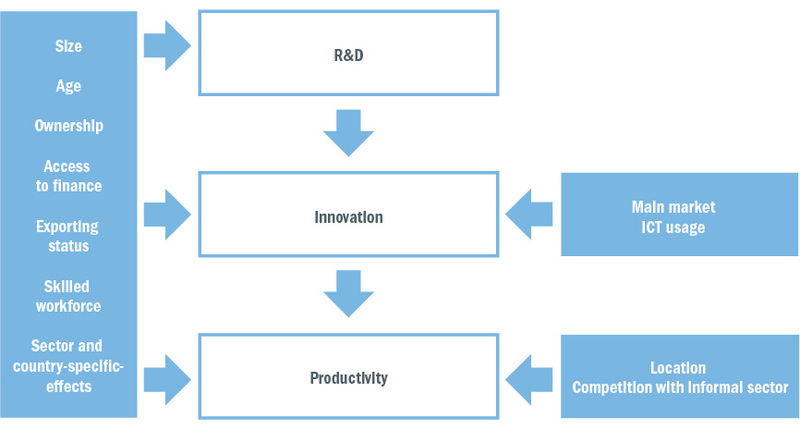 The results are obtained by estimating a three-stage CDM model by ALS, where productivity is linked to innovation, and innovation, in turn, is related to investment in R&D. For a detailed description and the set of control variables included, refer to Box 2.1. Standard errors are reported in parentheses below the coefficient. ***, ** and * denote statistical significance at the 1, 5 and 10 per cent levels respectively. Note: This chart reports the impact of firm-level process innovation and firms’ management quality by region, reflecting the impact on firm-level productivity, which is measured as turnover (in US dollars) per employee in log terms. The results are obtained by estimating a three-stage CDM model by ALS, where productivity is linked to innovation, and innovation, in turn, is related to investment in R&D. For a detailed description and the set of control variables included, refer to Box 2.1. The reported coefficients for process innovation are significant at the 1 per cent level in the CEB region, the SEE region and Russia, and at the 5 per cent level in the EEC region. The reported coefficients for management scores are significant at the 1 per cent level in the EEC region and Russia, and at the 5 per cent level in Central Asia. Other reported coefficients are not significantly different from zero. All in all, there are large differences in labour productivity across both firms and countries in the transition region. Every transition country has firms with high and low labour productivity. However, in less developed transition countries the percentage of firms with poor productivity is higher. How can firms boost their productivity? Analysis suggests that all types of innovation – product, process, marketing and organisational innovation – play an important role. Moreover, even if they do not advance the technological frontier, innovations which are new to an individual firm can still result in large productivity dividends. Returns to innovation are particularly high in low-tech manufacturing sectors, where innovation is less common. Another important source of labour productivity gains is improvements in the quality of management. In less developed transition countries, where the quality of management is generally poor, returns to improvements in management are high, while returns to process innovation are generally low.This suggests that management practices need to be improved before new processes can lead to sizeable productivity gains. In contrast, in the CEB and SEE regions, where management practices tend to be better, returns to the introduction of new processes exceed returns to further improvements in management. Cross-country analysis of the exports of various industries suggests that industries involving higher levels of innovation are able to grow faster, thereby driving overall economic growth – provided that the business environment is accommodative. These estimates also imply that the quality of the business environment is particularly important for the development of innovation-intensive industries. The results suggest that improvements in the quality of economic institutions are associated with increases in the innovation intensity of exports and output over time as innovation-intensive industries grow faster and their relative contribution to the country’s exports rises. Chapter 3 examines the relationship between the quality of the business environment and firm-level innovation in more detail. This represents the probability of R&D investment being conducted by firm i , where R&Di takes the value of 1 whenever the latent value of R&D reported by the firm, R&Di*, is larger than zero. Xi1 is a vector of variables explaining the occurrence of R&D investment, including the firm’s size, age, direct exporter status, percentage of employees with a completed university degree, and ownership structure (whether the majority of the firm is owned by a foreign company or the state), and the percentages of working capital and fixed assets that are financed by bank loans or loans from non-bank financial institutions (NBFIs). To account for sector and country-specific differences in firm-level investment in R&D, sector and country fixed effects are included. This set of variables is assumed to influence not only R&D investment, but also productivity and innovation, as shown in Chart 2.1.1. In this equation, the coefficient γ denotes the impact that R&D investment has on the probability of a firm introducing an innovation (as discussed in more detail in Chapter 3). Innovationi refers to the occurrence of the various types of innovation introduced in Chapter 1. The probability of observing such an innovation is explained by the vector Xi2 , which includes the set of variables that were introduced in the first stage, plus measures reflecting the firm’s level of geographical expansion (that is to say, whether the firm’s main product is mostly sold in the local market) and the firm’s level of ICT use (in other words, whether it uses email to communicate with its clients; see Chart 2.1.1). In this chapter, the focus is on the coefficient ξ, which reflects the impact that innovation has on labour productivity. In addition to the set of control variables used in the first and second stages, vector Xi3 , which is used to explain variations in productivity, includes information on whether the firm is located in the country’s capital or main business centre, and whether the firm competes with unregistered or informal firms (see Chart 2.1.1). Source: Authors’ representation of the model. Note: Based on Crépon et al. (1998). The scores for individual management practices (in other words, for individual questions) were converted into z-scores by normalising each practice so that the mean was 0 and the standard deviation was 1. To avoid putting too much emphasis on targets or incentives, unweighted averages were first calculated using the z-scores of individual areas of the four management practices. An unweighted average was then taken across the z-scores for the four practices. Lastly, a z-score of the measure obtained was calculated. This means that the average management score across all firms in all countries in the sample is equal to zero, with the management practices of individual firms deviating either left or right from zero, with the former denoting bad practices and the latter indicating good practices. There is a significant positive correlation between average labour productivity and the average quality of management practices (see Chart 2.2.1). As with labour productivity, there are firms with good and bad management practices in all countries. However, countries where the average quality of management is lower have a smaller percentage of firms with good management practices than countries where the quality of management tends to be higher. Competitiveness can be understood as a country’s ability to sell its products in the global market, so it has traditionally been measured as a country’s gross share of export markets. However, over the past two decades the world has witnessed rapid cross-border integration of production networks. This deep global integration means that analysis of a country’s gross export market share may result in misleading conclusions, since it does not account for the domestic share of value added in products. For example, if a particular export good contains many imported intermediate goods, the domestic share of value added will be small and gross export flows will say little about the country’s true competitiveness. To provide an accurate picture of competitiveness trends across the transition region, this box uses a methodology proposed by Benkovskis and Wörz37 to account for changes in the value-added content of trade. It combines a theoretically consistent breakdown of changes in export market shares with highly disaggregated trade data from UN Comtrade and information from the World Input-Output Database. This allows the traditional approach to measuring a country’s competitiveness (that is to say, changes in gross export market shares) to be compared with a value-added approach (in other words, changes in a country’s value added content in its gross export market share). Both approaches allow changes in competitiveness to be broken down into two main components: the extensive margin of trade (in other words, changes that are due to new products or markets) and the intensive margin (that is to say, export growth in existing markets). In turn, the contribution made by the intensive margin can be broken down into four elements: price factors (such as the exchange rate); non-price factors (such as quality and taste); shifts in the structure of global demand (triggered, for instance, by shifts in preferences for individual products); and changes in the set of competitors (for instance, the emergence of new suppliers providing identical or similar products). The value-added approach introduces a new component that captures the role played by a country’s integration into global production chains. The diamonds in Charts 2.3.1 and 2.3.2 indicate cumulative changes in selected transition countries’ global market shares for final goods in the period 1996-2011. The two charts paint a similar picture in terms of the growth of market shares. Bulgaria, Hungary, Poland, Romania, Slovak Republic and Turkey all increased their market shares, while Slovenia saw its global competitiveness decline. Thus, the trend in these countries was similar to that observed in other emerging economies, such as Brazil, China and India, which saw their global market shares rise overall during this period. The new breakdown described in this box reveals that the underlying determinants of increases in global competitiveness are very different when the focus shifts to value added. For a number of countries (including Bulgaria, Hungary, Poland, Romania and Russia), the contributions made by price and non-price factors are the opposite of what one would see using traditional statistics. As in other emerging markets, traditional trade statistics overestimate improvements in the quality of exported products in the transition region. The traditional approach suggests that improvements in non-price competitiveness have led to increases in market shares, while price developments have curbed competitiveness. A decline in the price competitiveness of Romania, for instance, means that, overall, the price of products that it exports in a given market has increased relative to the price of identical products sold by its competitors. Rising non-price competitiveness, on the other hand, could mean that the quality of products exported by Romania has increased overall relative to the average quality of identical products exported by other providers. The new breakdown reveals that the price competitiveness of transition economies has in fact increased, while the contribution made by non-price factors has declined considerably (even becoming negative in the case of Poland). For instance, an increase in the price of products sold by Romania (a decline in price competitiveness) may actually be due to an increase in the price of the inputs that it imports in order to manufacture those products, rather than being due to an increase in its own production costs. Similarly, improvements to the quality of the products exported by Romania may have been made upstream in another country (rather than being made in Romania). The new breakdown based on value added distinguishes between these different effects. Similar results are recorded for Brazil, China and India. Non-price competitiveness showed a negative – or, in the case of China, reduced – contribution to value-added market share gains. Thus, for all of these countries, their apparent non-price competitiveness based on their shares of gross export markets is largely the result of deeper integration into global value chains. Foreign consumers seem to attach a greater value to products from these countries because they are perceived to involve higher-quality inputs and carry better branding owing to outsourcing. In the case of Russia, this change of approach reveals an extraordinarily strong positive contribution by price competitiveness and a shift in global production chains owing to its energy-dependent export basket. In conclusion, this box shows that transition countries have been able to increase their share of global markets thanks to their ability to participate in global production chains. Poland, Romania and the Slovak Republic have been the primary beneficiaries of this change in global production. At the same time, the cost competitiveness of firms in the transition region allows them to build on their increased market shares. These firms’ ability to maintain price competitiveness despite unit costs converging with the levels seen in western Europe is an encouraging sign. Looking ahead, however, better branding and higher-quality production will remain key for all firms – irrespective of their participation in global value chains – when it comes to increasing their shares of world markets. Source: UN Comtrade and authors’ calculations. Transition Report 2009: Transition in Crisis?, Chapter 5, London.